FESTIVAL CUT has much more new evidence and analysis than earlier versions. Due to a faster editing pace, the strongest material has been compressed down to 100 minutes. Additional raw footage from Rick?s camera will be included as extras on the DVD. We are actively pursuing the truth regarding the tragedy of September 11th, 2001 and are scouring the world for information, video and or audio tapes, documents, etc. Your donation will greatly support our ongoing research. 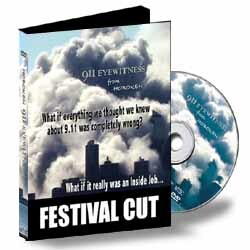 In appreciation of your generosity, please accept as our gift to you… 911EYEWITNESS, a two hour DVD presentation. This powerful documentary explores eyewitness testimony and scientific analysis of the collapse of the Twin Towers and Seven World Trade. The American Public and American Republic have been betrayed and now it’s time to learn the truth and share it with your skeptical friends.